After a visit from his daughter Lilly, Chris Parsons writes to her with news of how everyone at LandWorks is getting on. It was lovely to see you last week, your bit of the great cob wall of LandWorks is still standing and everyone wants you to visit again, including me. Joe has now started reading Private Peaceful; he’s 21 and says he can’t read. I reckon he can and has already started on his book. I need to catch him up, don’t want to be left out of the book club chat, four of us so far. It was Sarah and Will’s idea during a lunch, to encourage reading. Jack had an interview at K.J. Thulborn yesterday; he was so shocked when he got the job and a double shock when I took him up to KJ’s yard at 6.15am to start. He’s fifty and just chuffed to bits, although now suitably tired after 1st day! He said tonight that the one good decision he has made was to come here. He thinks it has totally altered his life. Jack and Fred seem happy in the flat next door, you can imagine how pleased Fred is to see his mate in a job… it sort of radiates hope and affirms a belief that you can do it. Fred has had an awful struggle to get any benefit money, 3 weeks since release and still counting, days not money! Don’t worry I was only joking about letting out your room to one of the other lads…but life is just about impossible without a roof over your head, so it did cross my mind…errr briefly! Macca has been manning the veg stall and loves chatting to unsuspecting customers. Our 7’2” salesman normally only attracts unwanted attention so as you can imagine he loves talking to people who are interested in him and the project. 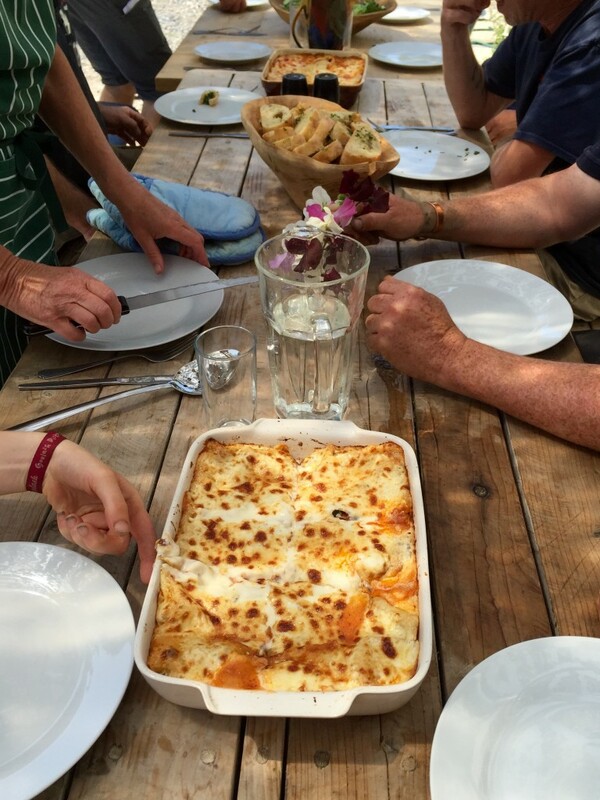 Funny thing at lunch today, Sarah and Neil, one of our new prison day-release cohort, along with Sue (super cook volunteer) made two lasagnes, to feed twelve of us…. Neil being a little competitive decided that one must be better than the other, there wasn’t. But you can imagine the sheer enjoyment of trying to decide. Pip was here today; everyone loves Pip, the boys are constantly cuddling or stroking her. She was having a little snooze in the afternoon sun, curled up on the paved eating area, when a gust of wind lifted the roof tarpaulin and deposited about a gallon of rainwater on top of Pip… one wet dog, causing her to get even more attention! I often marvel at this volume of love and affection and the importance of just being able to express a load of emotion… fortunately Pip doesn’t seem to mind. Had a nice call this evening from Liam, must admit I hadn’t heard from him for a while and vaguely wondered if he was back inside… Not at all, he seems well and up for a job and wonders if we can help. Do you remember Jamie? You met him; guess about two years ago, he said you were too nice to be my daughter! … Anyway he’s well and asks to be remembered to you. It’s good he stays in touch; I guess they all do really.